There are a few requisites of a good detective story which the seasoned reader of that class of fiction demands. The following list does not cover the whole ground, but without these the writer cannot hope to interest the true lover of detection. A good plot. The plot is the whole of a detective story. There may be character delineation, but it must be accidental. There may be sentiment, but it must be entirely subservient to the demands of the main plot. There may be pathos, but it must assist, not interrupt, the plot current. It—the plot—is what we are reading the story for; all else is simply thrown in for good measure. No superfluous characters. Every man, woman, and child, dog and darning needle, must have his, her, or its place in the plot, touching the other characters, or some of them, at all points, like the hexagons in a mosaic. No superfluous persons should be introduced merely as a blind; all must have use; and after it is all over, one must be able to look back, and perceive the raison d'etre of each one. A wrong clue. The reader must be led gently and fatuously on to think that he alone, of all readers, has the true solution—has caught the author napping, and discovered that which he has done his best to conceal. He must never be directed too plainly to the criminal, or he will take fright, and avoid that person of all others. Too much art is no art. But very cautiously must he be led to believe that he is smarter than the rest of the readers, and has seen through all the author's carefully planned subterfuges. Then, when he eagerly looks to the end for corroboration—with a pardonable smirk at his own insight—in one crash must the criminal be revealed—a person wholly other than the one he suspected. Only legitimate deception. The reader is entirely at the mercy of the author, and hence he is to be deceived only in a straightforward manner. The characters may be misled, each one in a different way if you will; but the reader is never to be told authoritatively a thing which turns out to be not true. 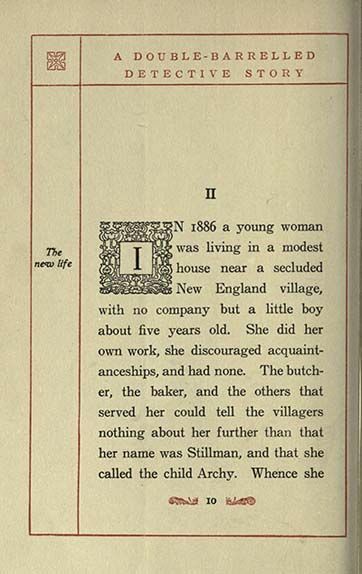 This misleading a reader, causing him to feel justified in believing a thing which is afterward denied, has spoilt many an otherwise good piece of detective writing; notably, a late story by a talented detective writer, in which the reader was told in so many words that a certain child was undoubtedly a boy, when the event proved it to be a girl. You must never make a fool of the reader—though you can fool him all you like. A tragic plot. A murder is the only really enthralling subject for a detective story. There have been good stories written on less tragic themes, but they are few; and it is hard to get up an interest over the finding of a diamond ring, or the reason why some man's wife has the blues. There must be real interests at stake before all the varied paraphernalia of detection can be made interesting. And it must not be too blood-thirsty a murder—no great interest or sorrow must be felt over the deceased. He is simply the keystone of the arch—not attractive in himself, but simply useful and indispensable. Plenty of obstacles. Don't let the work of detection be too easy, the path too smooth. Let the detective's perspicacity fail, his carefully laid plans miscarry. Let him follow a clue for pages, only to find it leads to naught. Slowly and steadily he must advance, only after many failures must his wonderful cleverness be vindicated. For, of course, he must be wonderfully clever. Hamlet without the Dane would be exciting beside a detective story without a marvelous detective. And last, let me say—stick close to your theme. After leading the reader up to a pitch of excitement over the main occurrences, do not open another chapter, or part, on a totally different scene, and slowly and deliberately bring characters and events down to the place at which you left off. Let everything move with a rush, from the finding of the body to the discovery of the criminal, each character contributing his own particular thread to the seemingly inextricable tangle of the plot. And yet, however seemingly inextricable, there must always be an inkling of the solution, a promise of the finale. The reader must not give up in despair, losing interest in the apparently clueless jumble. Keep him amused with his own private guess-work and conclusions, until you throw his little imaginings aside, and tell him all. So, then, with the warp threads of your plot held firmly in place, forming the same straight lines from beginning to end, so weave in the woof of characters, events, obstacles, dilemmas, all with the skillful touch of the old rug-makers, revealing only one side to the eager onlooker. Then, when he thinks that he has caught the Master Idea, and that you are not so subtle a weaver after all, then, I say, suddenly, with a turn of the hand, turn over the finished fabric, revealing the hitherto hidden side, which is the right one, and the one on which each thread plays its part in the perfect design.